Composed by James Horner (1953-2015). Arranged by John Moss. HL Full Orchestra. Movies. Full Score and Parts. 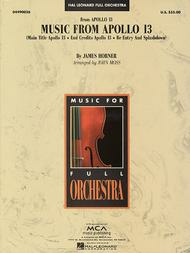 Published by Hal Leonard (HL.4490026). James Horner's magnificent score plays a key role in the emotion and drama of this memorable film with Tom Hanks. John Moss' medley opens with the plaintive solo trumpet theme and includes several of the film score's distinctive and inspiring themes.